2 cents on Dez Bryant and then I'm off to the Dodgers game! If you tell me that your dad was a pimp, and you say that your mom worked for your dad ~ then yes ~ I'd ASSUME your mom was a prostitute. HOWEVER, I'd probably catch myself and not ask outright the question nor would I be that explicit. I'd simply ask what she did. For example, she could have lined up Jons or handled money or been a housewife. WHO KNOWS. The issue and controversy has more oomph because Mother's Day is coming up, and people who are raised properly know that you DON'T say anything bad about anyone's mom PERIOD. Anyway off to the Dodgers game ~ Venue 65, here I come!!! 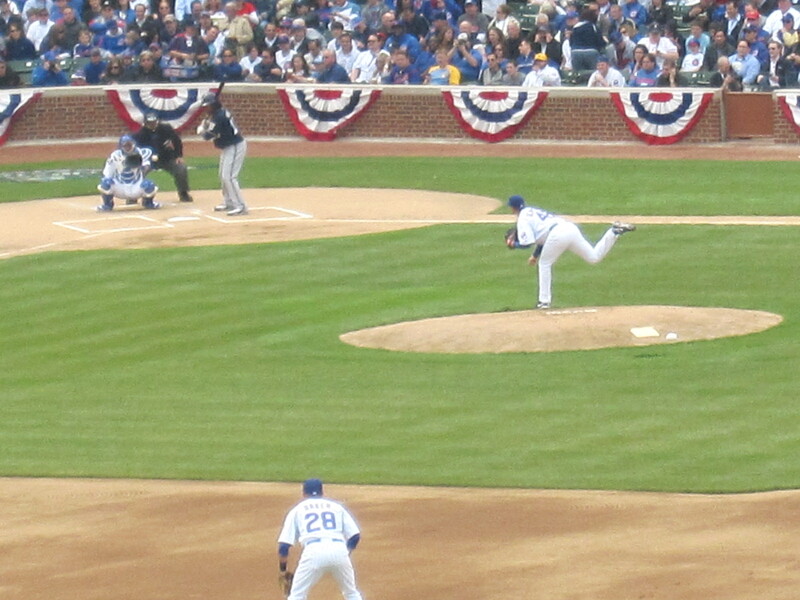 Go Dodgers beat the Pittsburgh Pirates! At noon today, if you're a Cavaliers Insider, you have the opportunity to purchase up to four (4) individual game playoff tickets per game for Home Games D and E.
(Game D is Round 2, Game 1 and Game E is Round 2, Game 2). So if you haven't signed up online yet, what are you waiting for?!?! I'd never been to Portland until Friday, but I know some people affiliated with the NBA and media who know that city very well. 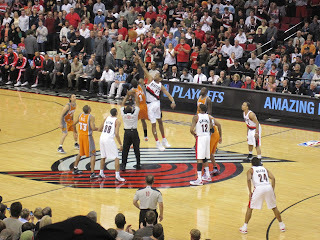 I decided some time last week that I wanted to go check out the Phoenix Suns v Portland Trail Blazers series. I'd never seen either team play at home. 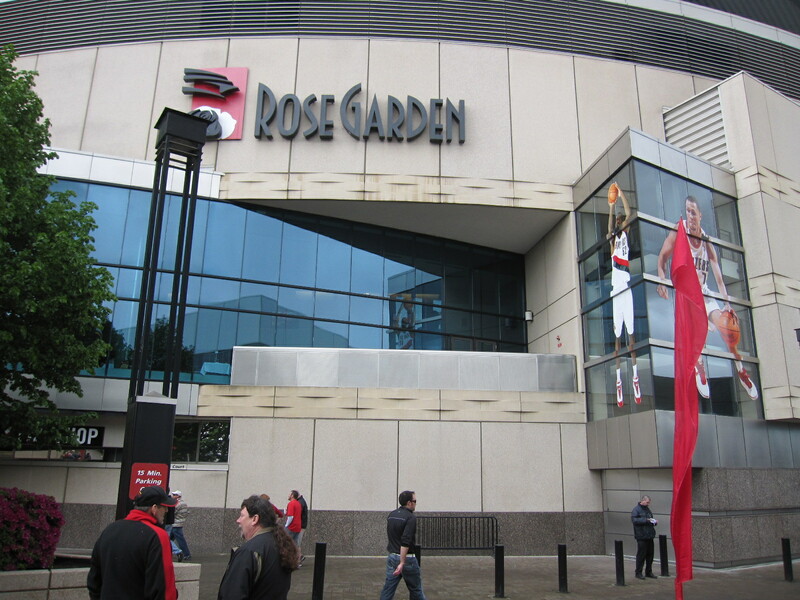 However, I fully expect Phoenix to advance to the 2nd round, and I've been to Phoenix numerous times ~ so I decided that it was time for a quick trip to the Rose Garden (i.e. my 64th venue). I arrived in Portland and went straight to my friend's place to drop off my luggage and work. Yes, I worked. Fridays are light, but they do require some attention. After work, I went to meet an old friend and NBA veteran. He and I hadn't seen each other in years, but we caught right up over the longest lunch in history. Starting off at a restaurant named Higgins and then off to El Gaucho I ate and drank my way through the city in good company, until my other friend came home from work. I recommend both restaurants highly, but will admit I didn't eat at the 2nd one. It was around 6:30PM and I received a text from my friend letting me know I had an extra 30 mins to chill since work was taking longer than usual. Perfect since I needed to nap. By the time 7:30/8 rolled around, another one of my friends (i.e. a beat writer who was in town doing some TV) had invited me to Henry's Tavern. Seeing that everything appeared to be in close proximity, my friend and I headed to Henry's. The 3 of us chatted it up watched a West Coast game and traded stories. It was a great time. Dan Majerle walked by our table with friends. The place was packed. We were all having fun. 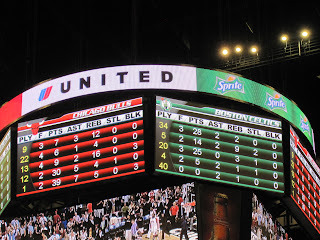 When the game ended, we tried to get my friend to come with us to Portland City Grill. No dice. He wanted to stay at Henry's and was off to Oklahoma City in the morning, so we said our farewells. **** Portland City Grill offers great views of the city and had a great scene. Sit in the bar area by the window, soak up the atmosphere, and relax. The petite filet was good and the white chocolate macadamia nut cookies w/ice cream were a great dessert choice. The next day after grabbing a coffee and hitting a park to people watch, it was off to lunch. I can't remember the restaurant's name but the pot roast sandwich and macaroni and cheese were amazing. Order both menu items and share with someone. It was a gorgeous day and the walk to the Rose Garden was an easy one. It felt like spring. After picking up the tickets and checking out the team store (i.e. I didn't buy a Trail Blazers hat), we went to our seats and then went down towards the court so I could wave to my friend who was doing color commentary. The teams came out to shoot around before the game started and I noticed Brandon Roy was out on the court. The idea of him playing was exciting, since he just had surgery on his knee. The game started and it was a close one. 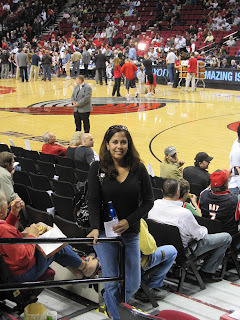 The Suns never seemed to get into their rhythm, and the Trail Blazers came out BLAZING!!! Portland was on fire. Vegas had established the line at Phoenix -2. My friend reasoned that taking the Suns was a sucker bet (i.e. enticing everyone to place their money on the Suns, so they'd lose and Vegas would win). Talk about being correct! 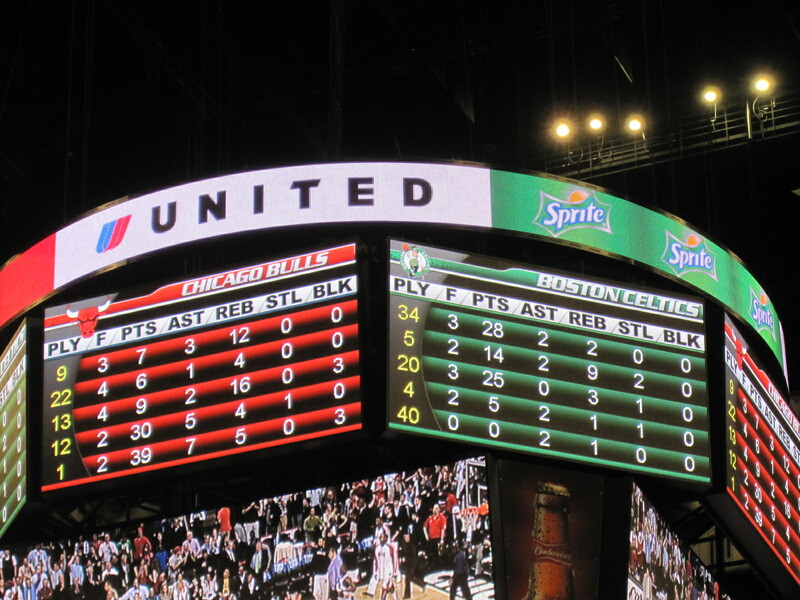 Portland won, and LaMarcus Aldridge proved to be the star. I definitely took notice of his game. 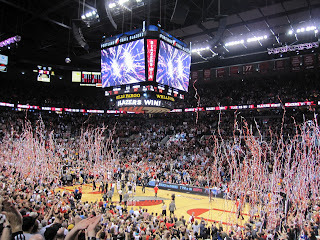 I certainy didn't expect to hear such a loud crowd and witness a Portland victory. 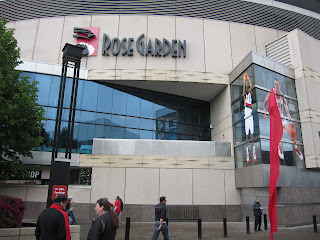 **** Actually on the way to the game, we passed a man who asked if we were headed to the Rose Garden. After saying, "Yes," he proceeded to bad mouth the Blazers and said Game 3 was awful. Well, I hope he changed his mind and gave his team another chance! Game 4 delivered when it came to excitement and to be honest it got HOT in the building from all the excitement. 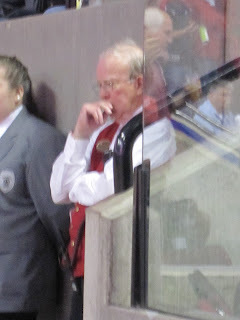 One thing I have to say is that the Rose Garden has the nicest group of ushers. Marlene was working over by the Suns bench and she's phenomenol. 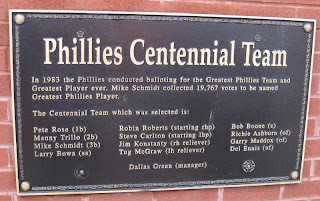 HOWEVER, "Ross" (i.e. 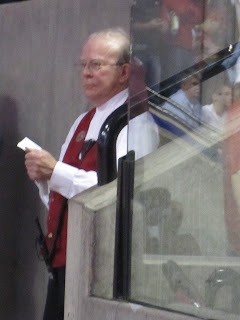 the usher from hell) was working the entrance A12 and he needs to be fired or reprimanded severely. 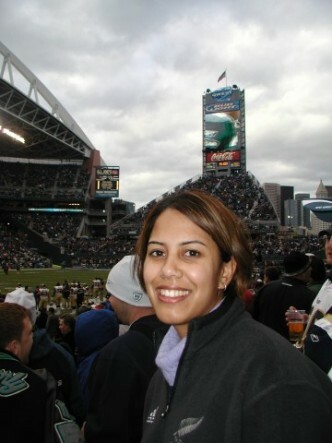 I'm waiting until Monday to log a formal complaint and I'm going to hit basketball operations and even Paul Allen. I'm not playing. This man took it upon himself to police another section and "shoo" people out of seats that he thought were sitting in the wrong seats. Well, he shoo'ed numerous groups of people and then tried to shoo my friend and I ~ when we hadn't moved since the opening tip. He was waving a sheet of paper and YELLING like a crazy person. 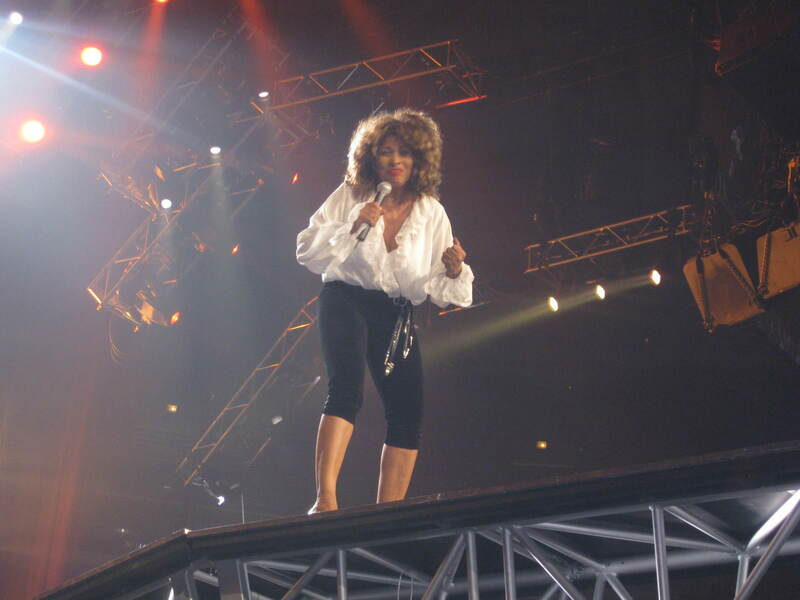 Then he ran over to the other side of the section to talk to the usher that had checked us earlier and she tried to get me to get up and walk over to her. 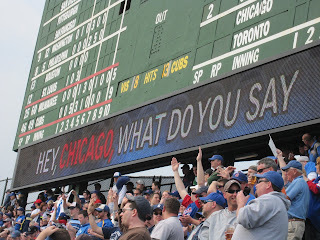 When I told her I had tickets, the old man continued to flail and wave like a crazy person, so I passed my ticket down. She passed the ticket back and he went back to his post. No apology. No nothing. Like I said, I've been to 64 arenas across the country and I've NEVER been harrassed like that in my life. "Ross", Worst Usher EVER: He knows I'm angry and that I'm taking his picture. 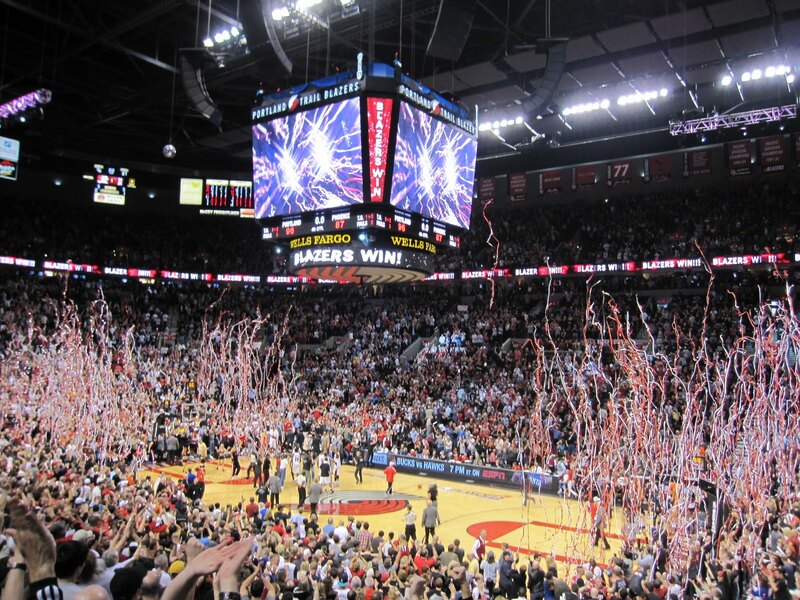 The Trail Blazers defeated the Suns, 96-87. After the game it was off to the On Deck Sports Bar & Grill to catch the end of the Penguins game and finish the rest of the NBA night games before heading back to get my "luggage" and flying home. Tiger Woods announced that he's adding the AT&T National at Aronimink Golf Club · Newton Square, PA (i.e. Congresssional is being renovated for the 2011 US Open) in to his schedule. The tournament is Thursday, July 1 – Sunday, July 4, 2010, and Tiger Woods is the defending champion. I've actually had to go to Newtown Square, PA for work and it's a relatively easy drive from the DC/VA/MD area and close to Philadelphia. For those of you that live in the DC/VA/MD area you may find the following information of interest. When I looked at the tournament ticketing information, I noticed the following text on the tournament's website. I copied and pasted it here for your convenience. Thank you for your support of the 2009 AT&T National! To express our gratitude to the local Washington, D.C. community, we are offering all Maryland, Virginia, and Washington D.C. residents free admission to the 2010 AT&T National at Aronimink Golf Club! Simply present a valid Maryland, Virginia or D.C. driver's license at the gate to receive your Daily Gallery Pass for FREE! 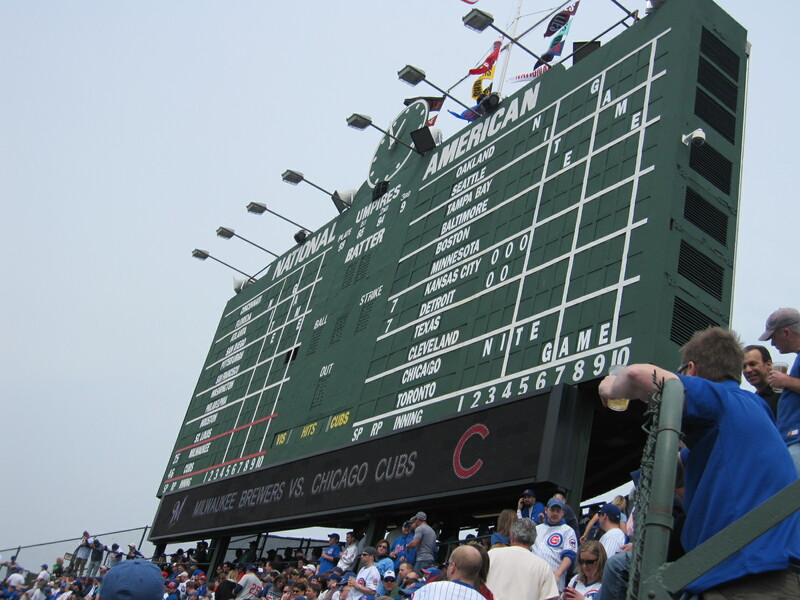 To reserve your complimentary 2010 AT&T National tickets, click here. For more information about tickets please contact our ticketing team at ticketing@tigerwoodsfoundation.org. **** When you click the link and complete the form it says it's for a free Gallery ticket for one day only. The ticket will be held at Will Call. Of course there are other ticketing options for the golf tournament, but I found that offer to be the most interesting. 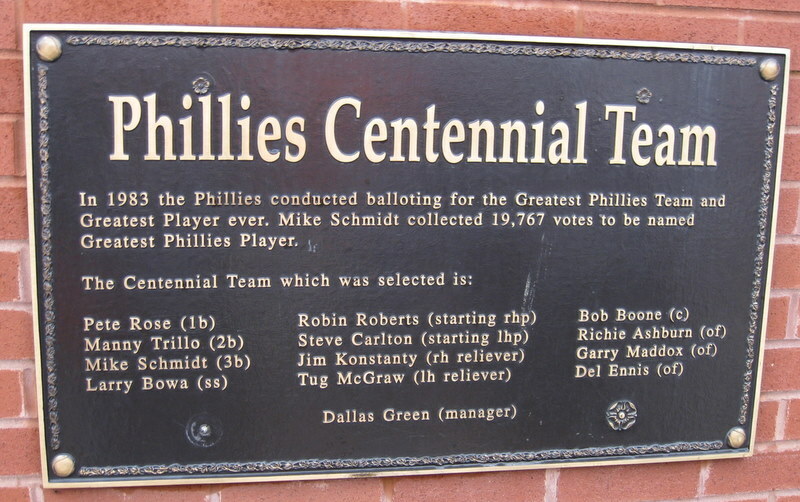 Coincidentally, the defending National League Champion Philadelphia Phillies are playing the San Diego Padres at home, on the same dates of the tournament. 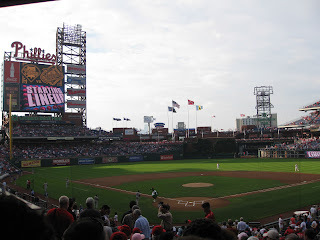 Have you seen the Phillies play at home, yet? 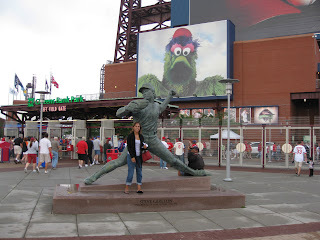 If not, you should go and check out Citizens Bank Park. It's a great fan friendly, ballpark! 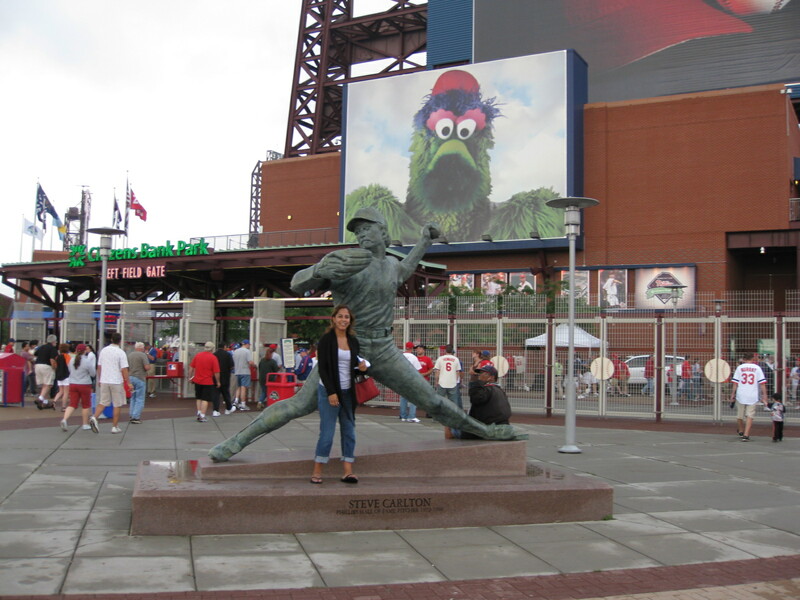 So, if you have no plans for the 4th of July, why not consider Philadelphia? 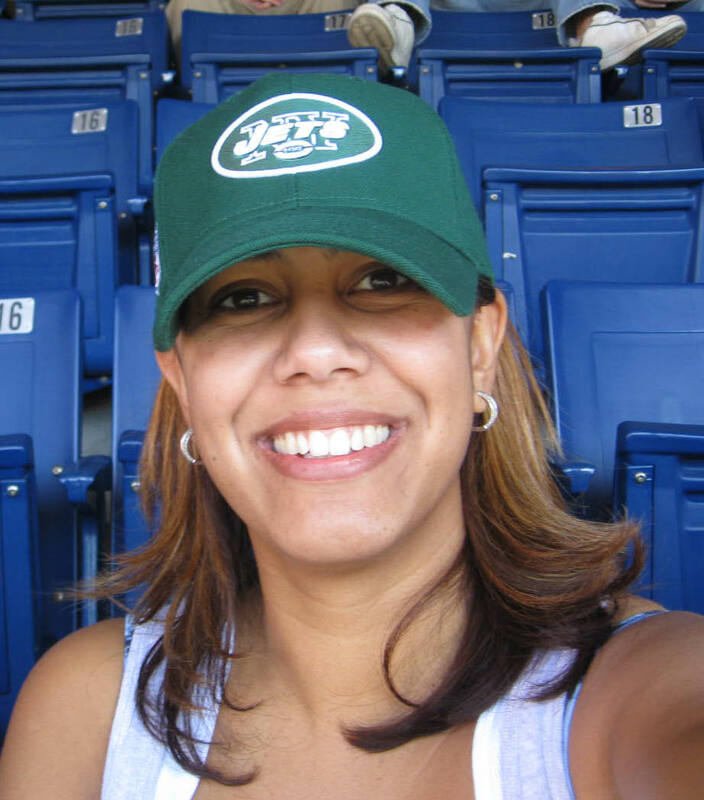 It'd be very easy to make a fun sports weekend, holiday trip out of it all. Ben Roethlisberger suspended for 6 games ~ What do you think? 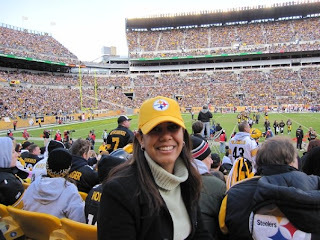 All I can say is that I'm happy I went to Heinz Field LAST year... If you've never been to Pittsburgh to see the Pittsburgh Steelers play, you must make the trip. 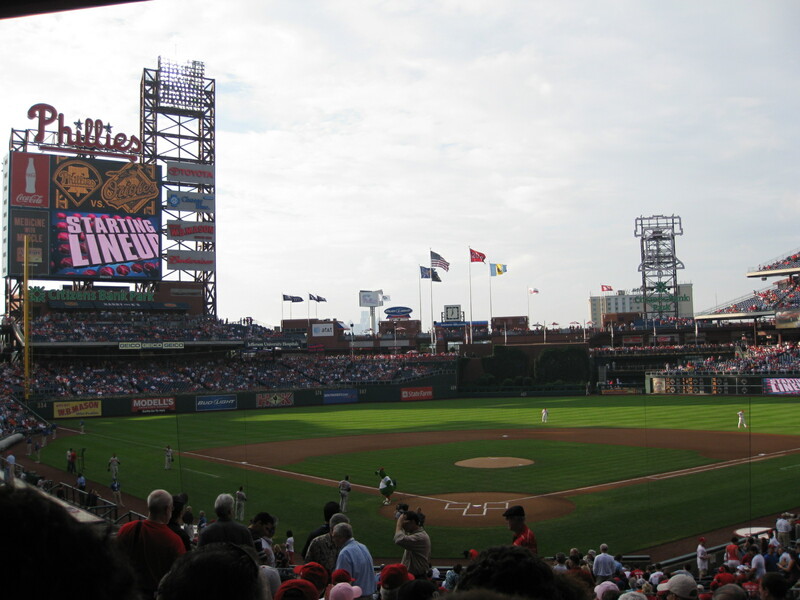 The stadium is located right downtown, near the Pirates Stadium (i.e. which looks great also). If you go to Heinz Field, expect to see Steelers black and gold everywhere! These fans are passionate about their team. If you're not coming to the game in your gear, definitely hit a team store or a souvenir stand pronto. Earlier today, even though no charges were files, Roger Goodell suspended Ben Roethlisberger for 6 games as a result of his violation of the NFL's conduct policy. Essentially, Ben is being punished for his bad judgment. I'm watching TV, and I believe this hits the QB in the pocket for about $3 million. Now I don't know Roethlisberger, and I haven't been closely following his case. However, I know how I feel about this suspension, and I'm definitely curious to hear what you think. You can leave your comments anonymously if you wish. When I was younger, I used to be a huge Lakers fan. My dad told me that he'd take me to the Forum to see my team play. My dad usually keeps his promises, so we won't hold it against him ~ but needless to say I never made it to the Forum. I've already been to the Staples Center for a Lakers game. 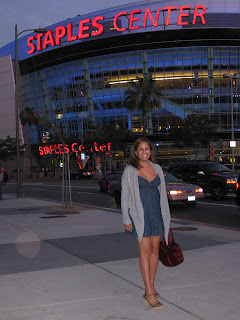 I went during the playoffs last year when the Lakers were taking on the Jazz. I had had a good run in Vegas, where I was spending a few days on vacation with my cousin's wife. I remembered that the Lakers were playing that night, so when I woke up, I planned out our trip. We rented a car and drove from Vegas to LA for the game. ****Technically I need to go back for a LA Clippers game, in order to really cross the venue off of the list for basketball, but that's a whole other story. Enough history. The real question is: Did you see the Oklahoma City Thunder v LA Lakers game tonight? It was Game 2, and now the Lakers are up 2-0. For those of you who care about numbers, the final score was 95-92. In between planning my trip to Portland and trading messages with my friend out in Phoenix, I watched the game on TV. Wow. What a fight the Thunder put up! It was a close game, and because of it, I think this loss may hurt the Thunder more. I can't be alone by feeling this, but towards the end of the game I found the OKC Thunder's shot selection to be strange and the missed Laker free throws to be frustrating. The Lakers never really shut the Thunder out of the game, and even though the Thunder had the lead at various points they were never really able to pull ahead convincingly. Earlier tonight, my friend predicted that Kobe Bryant would score 40. He actually ended with 39, and Kevin Durant ended with 32. The Lakers are the Lakers, and I don't need to characterize them because they're pretty well-defined. The Thunder need a few words, as they continue to gain respect and create an identity. 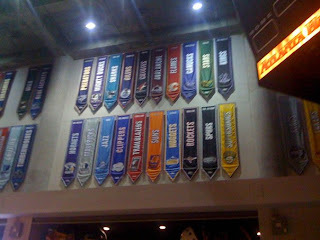 On the concouse in Atlanta, the Thunder aren't even represented. They are coached by Scott Brooks, who I met briefly during this year's NBA All-Star Weekend in Dallas. For those of you that like trivia, interestingly enough, he used to be roommates with Zydrunas Ilgauskas during the 1997-1998 season, in Cleveland. Coach Brooks seems like a solid man ~ very humble, no ego. **** Updated, 4/21/2010: Congratulations to Coach Scott Brooks, NBA Coach of the Year. I'm very curious to see how the Thunder respond on their home court. Game 3 is on Thursday at 9:30. **** I just got a comment sent to me about the Thunder being the former Seattle Supersonics. Needless to say it came from a friend of mine from high school, who lives in Seattle now. I spent a weekend in Seattle once. I don't remember the year, but in that weekend, I went to the NFC Wildcard game (St. Louis Rams v Seattle Seahawks @ Qwest) and caught the Sonics v Heat game at the Key Arena. All I need to do is hit a Mariners game, and I can cross that city off of the list too! Last night, I parked myself in front of my TV and flipped channels. That might sound lame to some, but for me, it was about all I could handle. 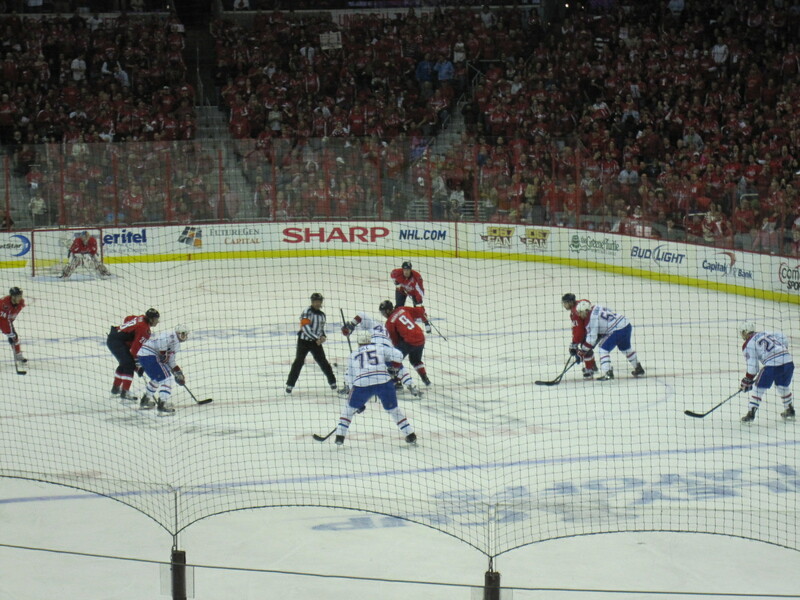 First up was Game 3 for the Washington Caps and the Montreal Canadiens. I started watching hockey, 15 mins into the game. Before you knew it the Caps were up 4-0. Nice! Realizing that the Caps didn't need my moral support I started focusing on the Cavs game. The Cavs were up 10 points and Shaq was on the bench sweating like Patrick Ewing. A 10 point lead isn't the end all, especially since it was early, but I wasn't interested in watching the game. 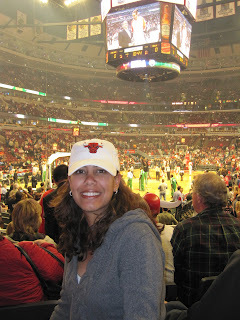 No matter how I tried to get into the game, the Cavs v Bulls series just doesn't interest me. I don't believe that the Bulls are a threat to the Cavs. I'm not a fan of Joakim Noah either. I didn't like him in college, and I don't like him in the pros. He seems awkward to me. I remember I had dinner with some of my sporty friends and one of them told me that Noah was killing it on the boards and really proving himself. As I politely smiled and then yawned into my napkin, I'm sure my disinterest was apparent. The only Noahs that interest me are Yannick and the one who managed to gather pairs of animals and survive a storm for 40 days and 40 nights. Both of those men's stories, I find far more fascinating than the youngest Noah. Shoot... 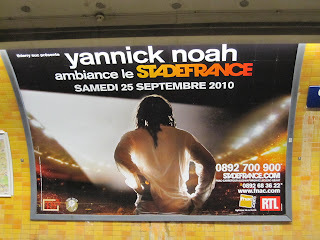 When I was in Paris, I found myself intrigued by the billboard I saw for Yannick's concert. However, while in Chicago, Joakim was the furthest thing from my mind... 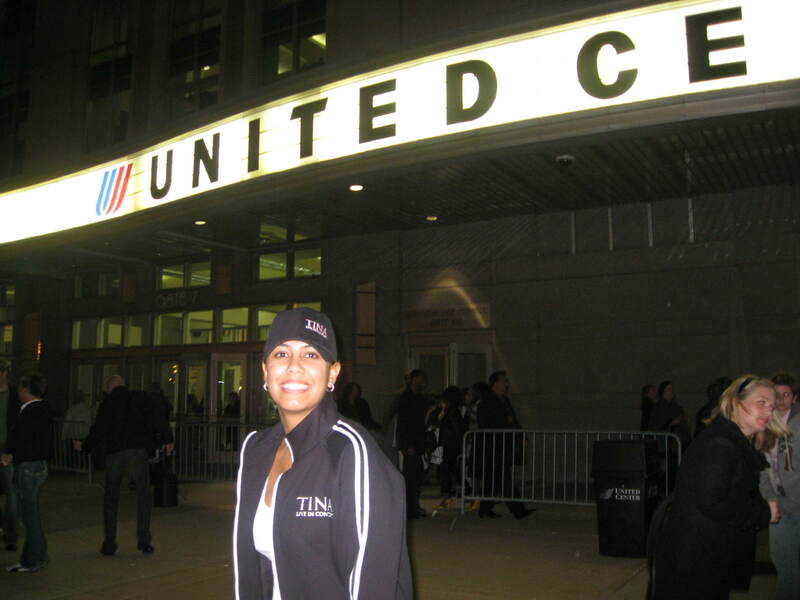 I wanted to see Derrick Rose and the United Center. 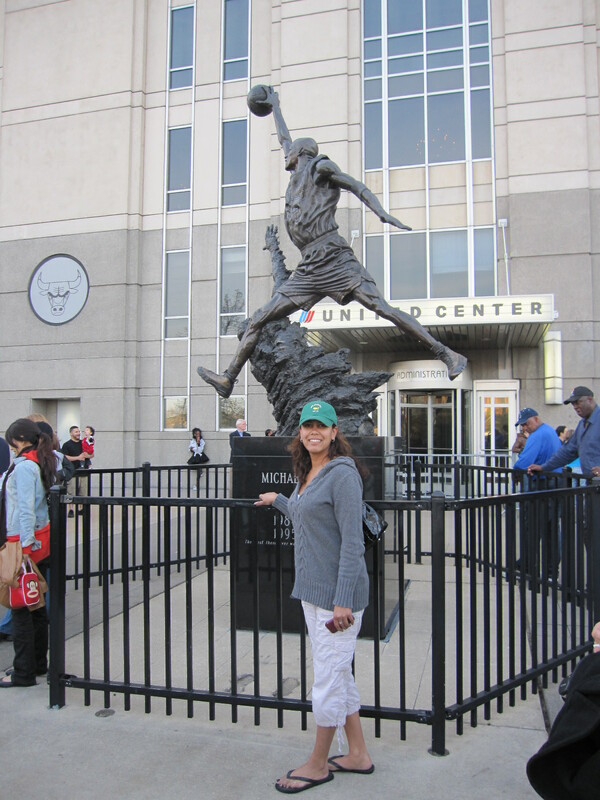 Yep, the building was more exciting to me than Joakim. **** There's an "I hate Joakim Noah" facebook group. I thought about joining it, but next to "Affiliation" it reads, "Peyton Manning is overrated." Um, excuse me. As a Colts fan, I'm definitely not down with that. Oh well. They almost had me. Can someone tell me what Joakim's problem is? Why does he think he can start jawing with LeBron James in Cleveland? Further to cement, my feeling that Noah is just terrible, check out the video of him trashing Cleveland. Now, I'm sure that Cleveland isn't at the top of the list in terms of vacation destinations, but I'm also confident that there are at least 20,000 people who'd be more than happy to put Noah on the Rapid and send him back to the airport. Don't worry, Joakim. You'll be on vacation soon enough! Feel free to go wherever you want in the off season. The last game I watched was the Jazz v Nuggets game. It was Game 2 and was being played in Denver. The injury riddled Jazz managed to defeat the Nuggets. Injury riddled... With Kirilenko out and Mehmet Okur rupturing his Achilles it should've been an easy game for the Nuggets... "Should" was the key word. What is going on with the Nuggets? Sure, they're not the same team they were now that George Karl is tending to his health, and Adrian Dantley has assumed coaching responsibilities. George Karl's presence is obviously missed. I know Adrian Dantley is knowledgeable, but he only had 1/10 of the passion to win last night's game compared to me. I'm actually a little surprised that the folks in Denver didn't tell me to, "Shut up," because my inside voice was SCREAMING last night. Being a Cavs fan, I'll say this. I know Gordon Gund to be a class act, and I respect Jim Paxson. 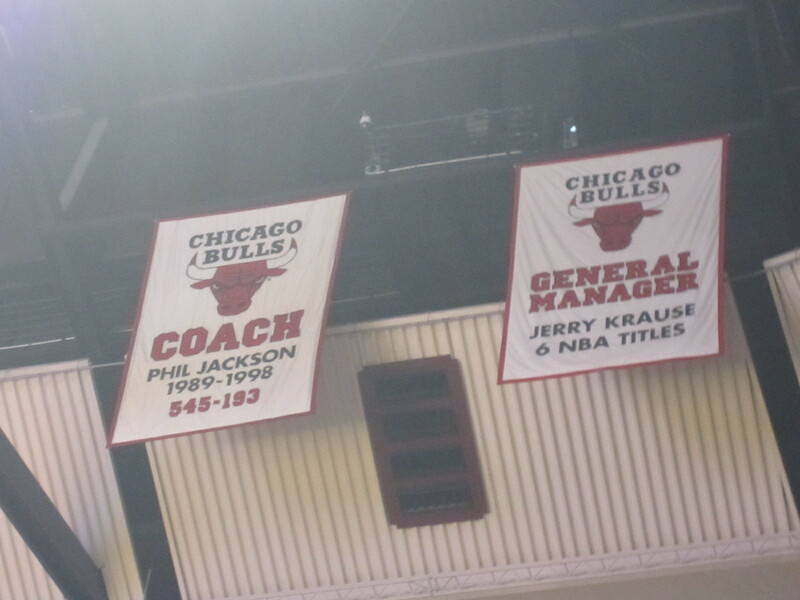 I believe in Paxson's basketball knowledge. 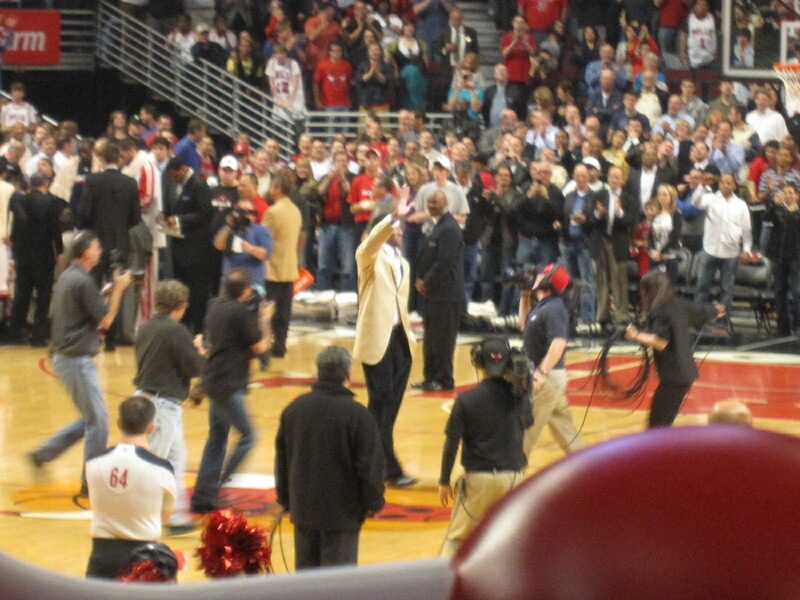 Based on those statements, you can deduce how I feel about Boozer (i.e. especially when it comes to the Cavs). Boozer had a very strong performance last night. Come on Denver, let's stop getting tattoos, practice, get it together, and WIN! Actually now that I think about it, when the Nuggets were in town to play the Wizards, the Wizards won 107-97. Seriously... What is wrong with Denver? Enough about all that. 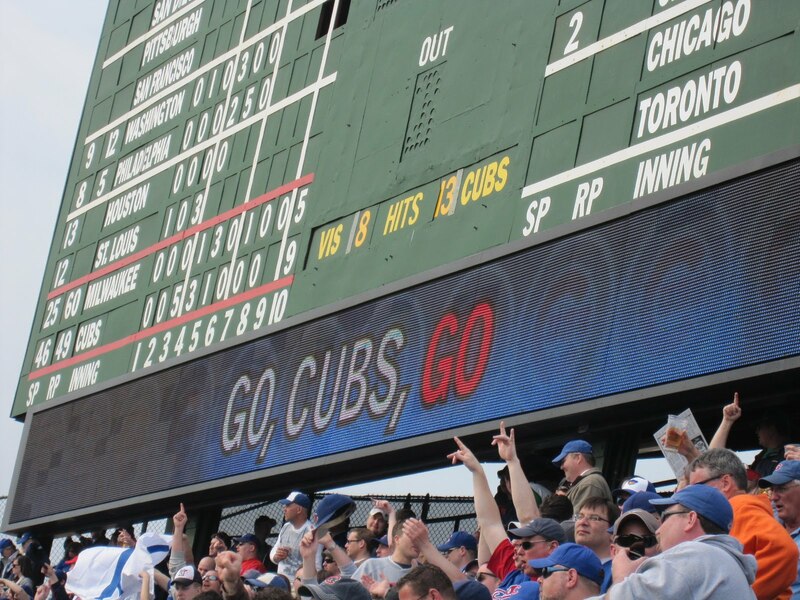 Today is a brand new day and there is a full slate of games on tonight. Bucks and Hawks tip at 7. Heat and Celtics tip at 8. **** Earlier tonight, for his Twitter fans, dwadeofficial, posted this: "First 1 to get this question rt. How many players on Miami and Boston R from chicago??? And name them." If you're not on Twitter and you're a fan, you might want to correct the situation. 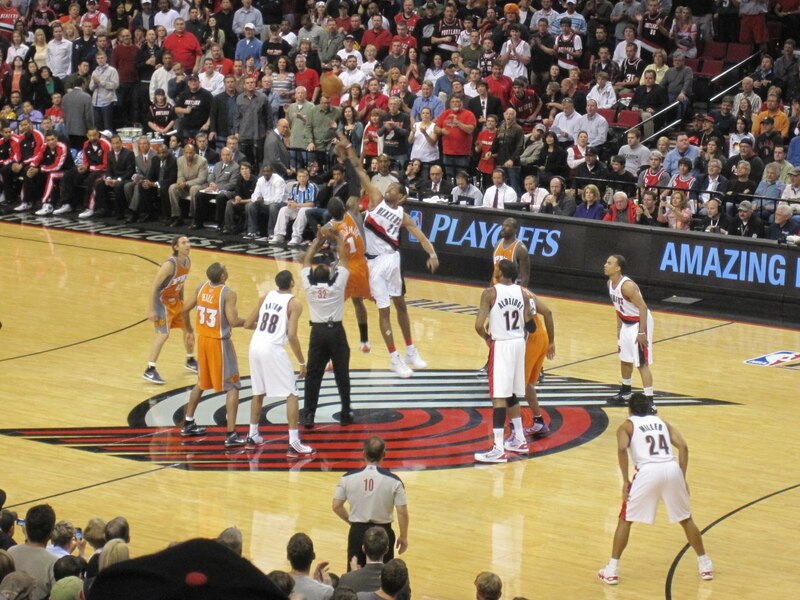 Trailblazers and Suns tip at 10:00. Thunder and Lakers tip at 10:30. If you follow this blog, you know who I want to win... Let's go guys! BRING IT!!! 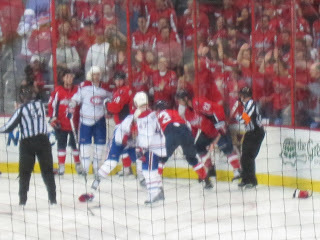 On Thursday night, I watched an exciting Montreal Canadiens v Washington Capitals game, that ended with the Caps losing in overtime. 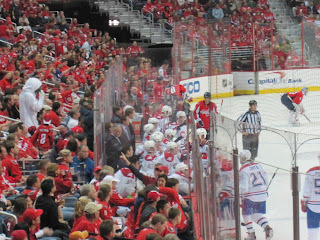 I watched the game on TV and regretted not being in attendance at the Verizon Center. Last night's game in one word, can be summarized with, "UNBELIEVABLE". 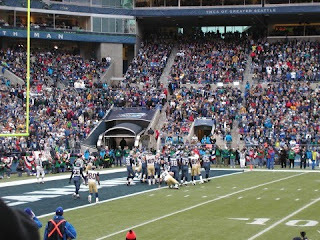 Thanks to Metro's delays, I was about 5 mins late to the game. Yes, I took public transportation. It's ridiculously convenient to the arena, and the prudent thing to do. 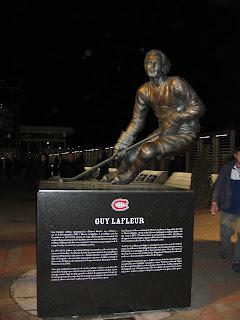 Just my luck due to service delays, by the time my ticket was scanned, Montreal had scored. The scoreboard read 1-0, and the bad were guys up. Next thing you knew it was 2-0. Great. Jose Theodore was yanked out of the game, and Varlamov was placed in goal. New goalie, new game... 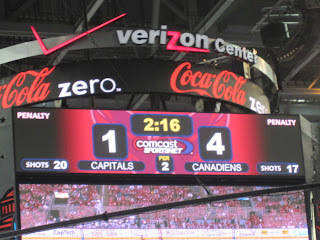 Finally, still in the 1st period, we got on the board thanks to Eric Fehr, who scored his first goal in the Playoffs. 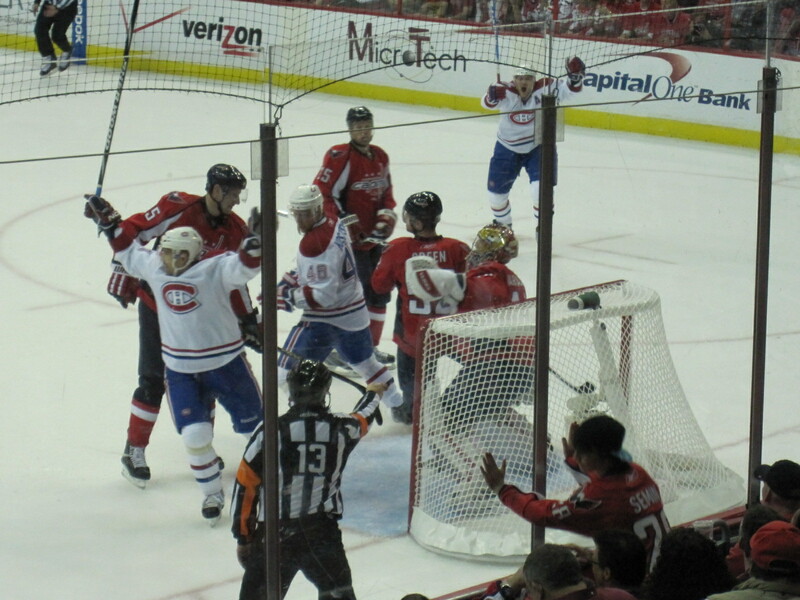 Time elapsed, the Canadiens caught fire and next thing you knew the Habs were up 4-1. 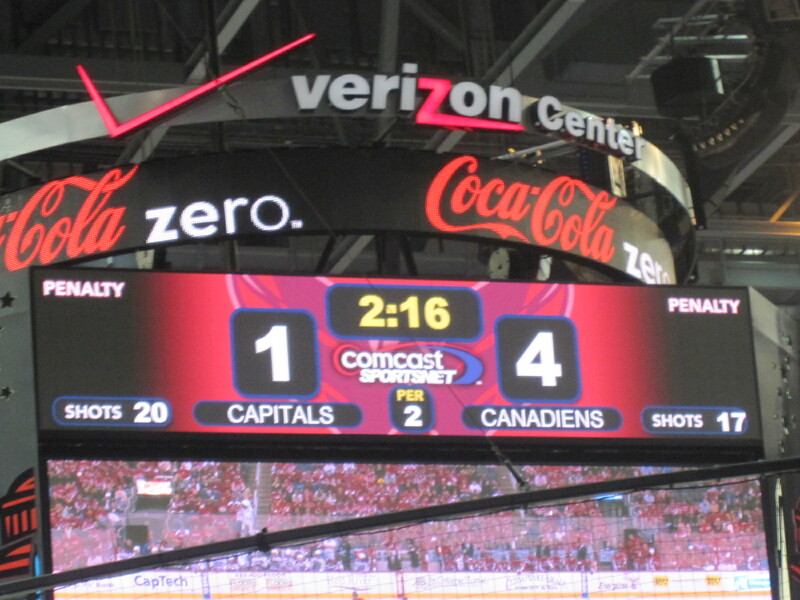 With a 3-goal deficit, things weren't looking good for Caps fans, but unlike in basketball games where it appears there's going to be a blowout ~ Caps fans stay. 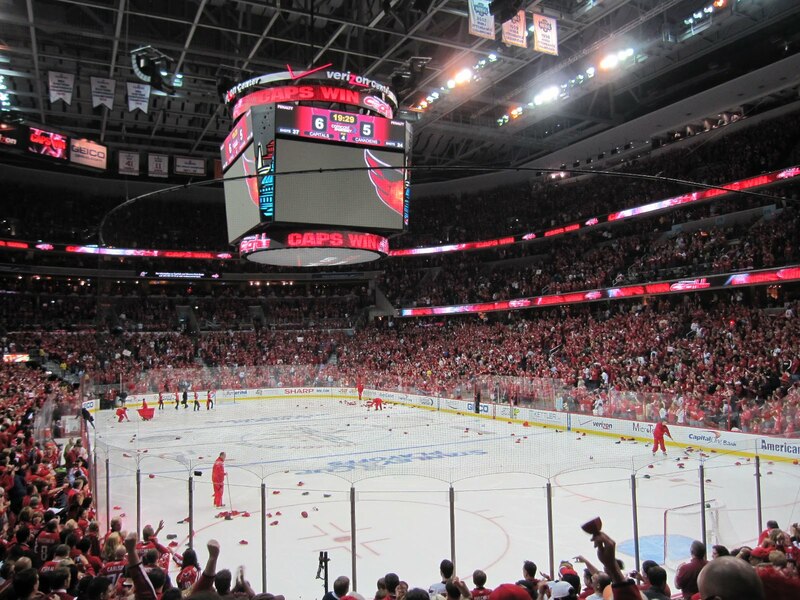 The entire arena was "Rockin the Red" and no one was going anywhere. During the game, I was texting scoring updates to my friend in Canada, who couldn't watch the game, since he was at a business dinner. Each time I'd text him that his Habs had scored, I'd receive the same response, "OMG". Even he couldn't believe it! If you can't beat them, why not fight them, right?!?! I mean, this is hockey... 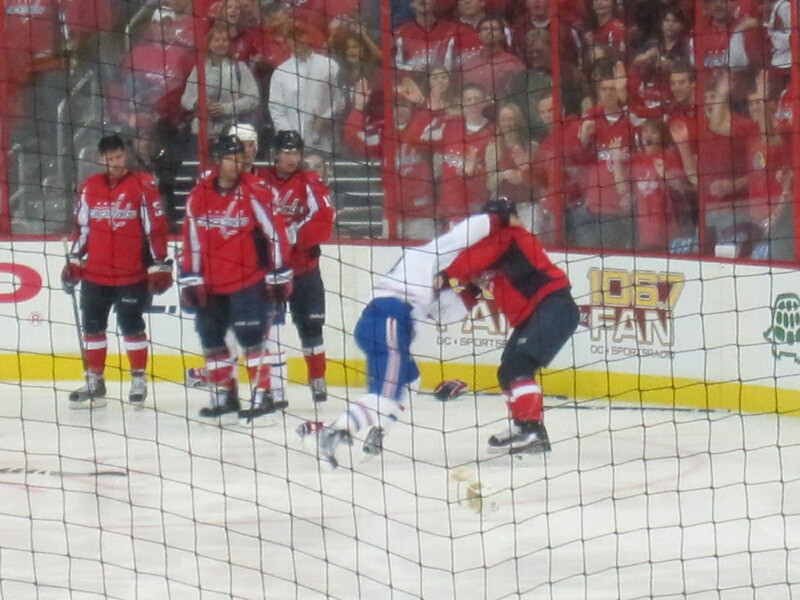 So, in the 3rd period, Caps fans were treated to a fight when Tom Poti and Scott Gomez decided to mix it up. Told you this game had everything for a hockey fan..
Sure enough, the Caps were able to find their offense and John Carlson scored his first goal of the Playoffs. 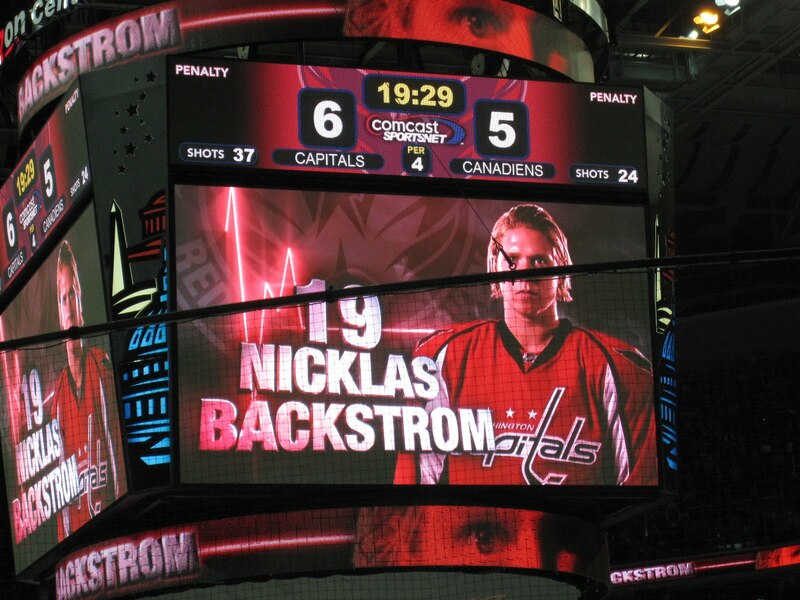 Carlson's goal tied the game at 5, and we were heading into OT. 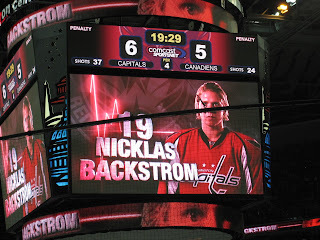 So many stories can be told about Saturday night at the Verizon Center, but the hero of the game was Nicklas Backstrom who notched a hat trick and led the Caps to victory in OT! 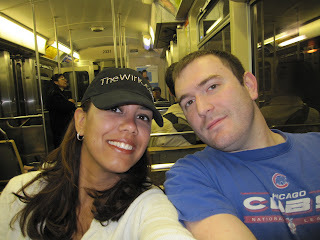 On the way home from the game, I ran into someone I knew on the train. Actually, the minute I got on the Metro I heard someone yelling my name. Imagine my surprise to see that it was a guy wearing a mask. 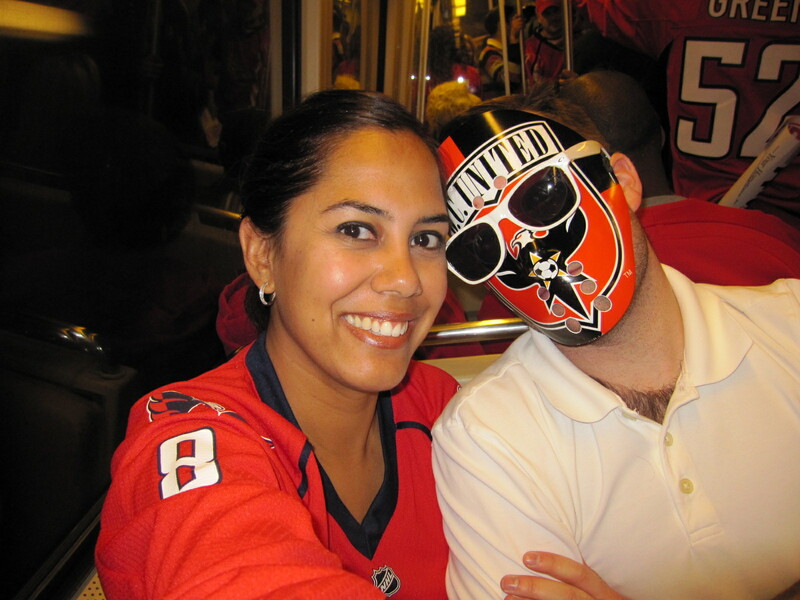 "Mask guy" was creeping people out on the train and drunk from the DC United soccer game. 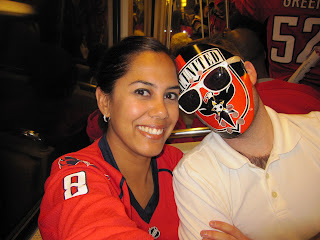 He couldn't tell me if DC United had won, but needless to say no one bothered me on the train, while he was next to me. Yes, I have strange friends. Go Caps! 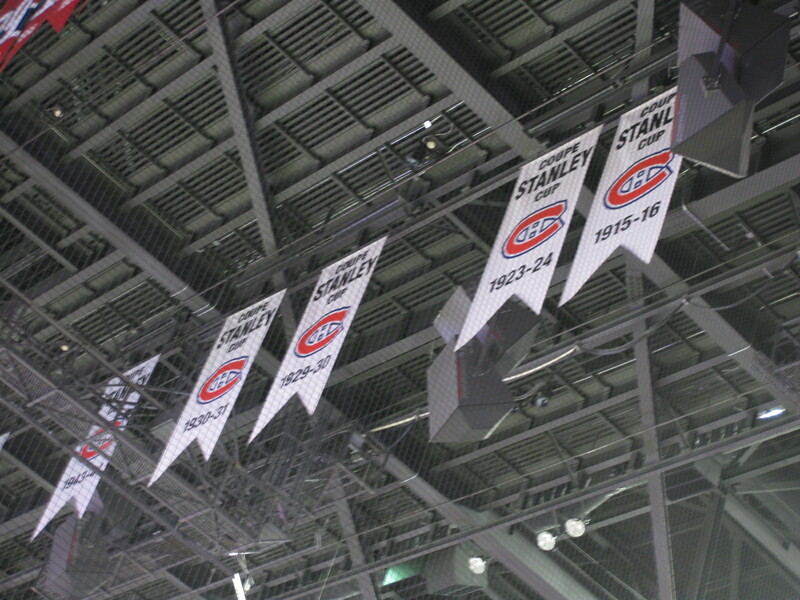 Game 3 is on Monday in Montreal, at 7PM. I've already read, Rita Ewing and Crystal McCrary's book, Homecourt Advantage years ago and recognized the characters of my past in print. I say, "characters" because I've never met the authors, but I know the personas and type of people that are written about in the book, because I lived it for more than 4 years. Anyone who's on the periphery or dead center in the game and maintains a relationship, personally or professionally with someone associated with professional basketball can identify with the book ~ and if he/she disagrees, then he/she is lying. OK, after being sent the link and a few emails about Basketball Wives, Season 1, I'm finally downloading Episode 1. I have mixed feelings about what I think I'm going to see. I doubt there's anything that'll really shock or surprise me, I've been there and done that and whatever I haven't lived, I've seen... It was the best of times, it was the worst of times ~ but those years sure were interesting! According to EW.com (Entertainment Weekly's online presence), "VH1 has ordered eight episodes of a new reality show called Basketball Wives that will reveal what it’s like to be married to, dating, or done with an NBA player. Participants include Jennifer Williams (wife of Eric Williams), Evelyn Lozada (ex-fiancé of Antoine Walker), Mesha O’Neal (wife of Jermaine O’Neal), Royce Reed (mother of Dwight Howard’s son), Faith Rain (Udonis Haslem’s girlfriend) and Shaunie O’Neal (wife of Shaquille O’Neal), who will also serve as an executive producer." I have no idea what I'm about to see, and I'm curious how honest these women are going to be. I know I wouldn't want all of my business thrown out there for public consumption. Some secrets and stories I'll take with me to the grave, because they're no one's business... I saw that Shaq (i.e. who is resting and not playing tonight as the Atlanta Hawks take on the Cleveland Cavaliers) has referred to the show as "televised revenge". Well you know the saying ~ "Hell hath no fury like a woman scorned." The next episode of Basketball Wives is scheduled to run on April 18. The show is on Sundays at 10PM EST on VH1. Here's an oldie but a goodie for you, Skee-Lo's, "I Wish". You're welcome. The Bulls take on the Celtics tonight at the United Center - Big game! As the race for the 8th spot in the East continues, I find myself in Chicago biding my time til this evening's Boston Celtics (50-30) v Chicago Bulls (39-41) game at the United Center at 7PM, Chicago time. 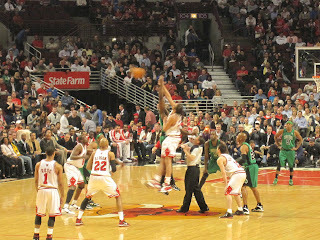 The Bulls defeated the Raptors on Sunday in Toronto. 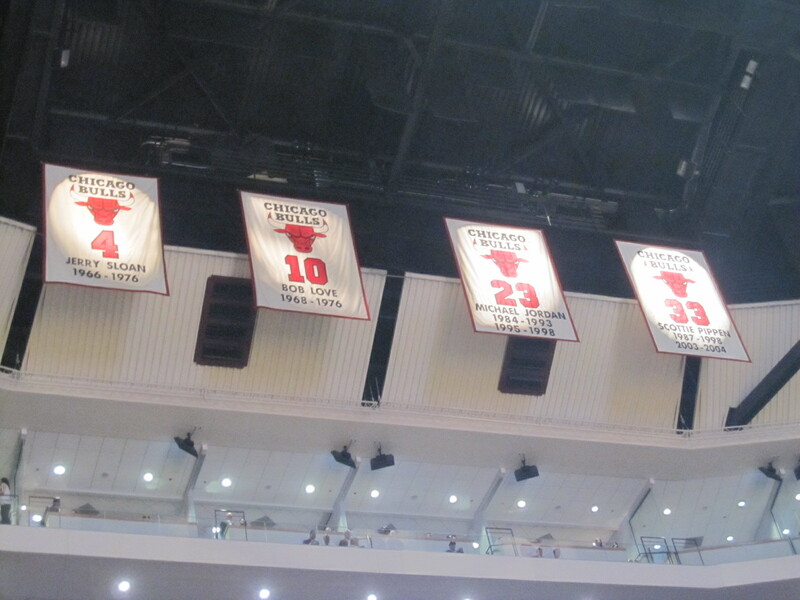 Ironically, the Raptors are the Bulls' competition, and tonight is the final home game of the season for the Bulls. Therefore, this game is important for so many reasons. This game counts! 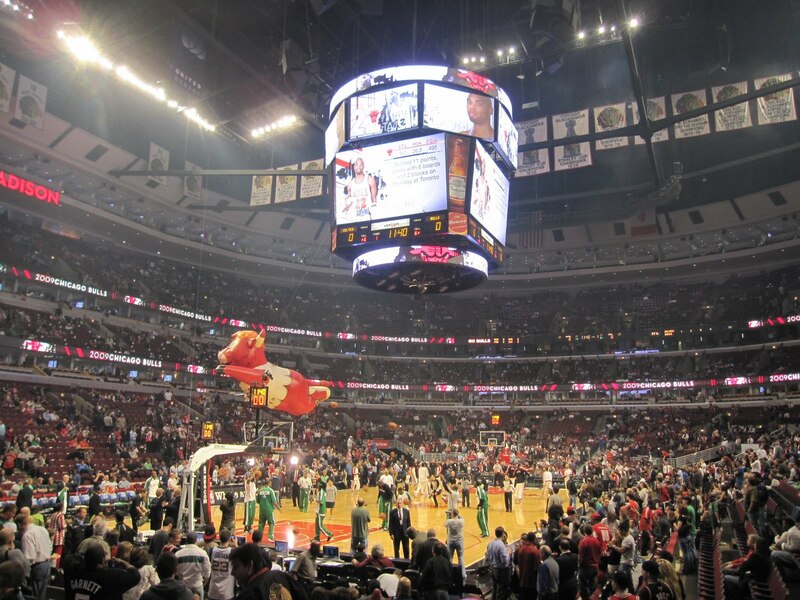 Teams like the Cavs and the Lakers are resting their stars, but the Bulls will need to dig down deep and earn a victory tonight in order to maintain their position and participate in the post-season. Toronto is 9th, right now and currently not going to play in the post-season. This will be my first trip to the United Center, for a basketball game so this game is important to me also. 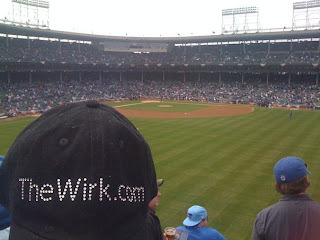 Don't forget, I have a goal to hit all the stadiums, arenas, etc. for all of the professional baseball, basketball, and football teams. I'm not ready to commit to attending home games for all of the hockey teams, yet. My current count is 62. Therefore, this game counts personally! 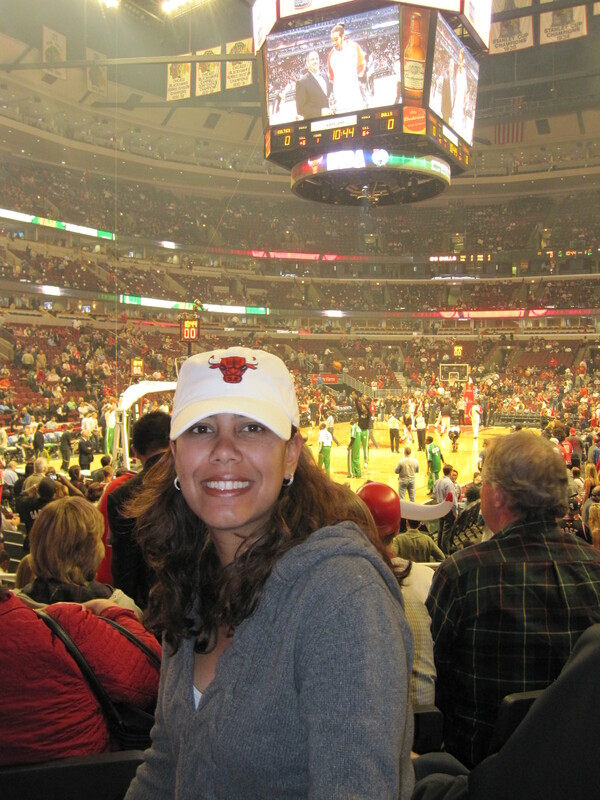 However, as a Cavs fan, I'm not sure I can bring myself to buy a Bulls hat. My brain keeps going back to Jordan's shot over Ehlo in the 1989 Playoffs... Ouch. The Shot still hurts. Cavs fans look away. 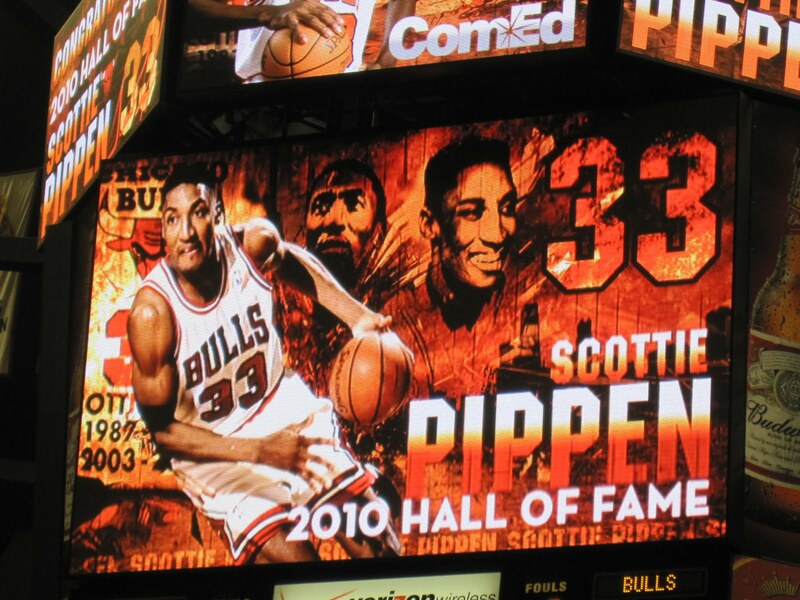 Bulls fans here you go. Narrating this clip, that I found on youtube is Joe Tait. He's the voice of the Cleveland Cavaliers and amazing! I'm convinced he could talk me through performing open heart surgery with his play calling and attention to detail. 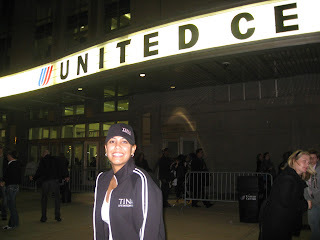 For you music fans out there, the last time I was at the United Center was for the Tina Turner concert in October 2008. 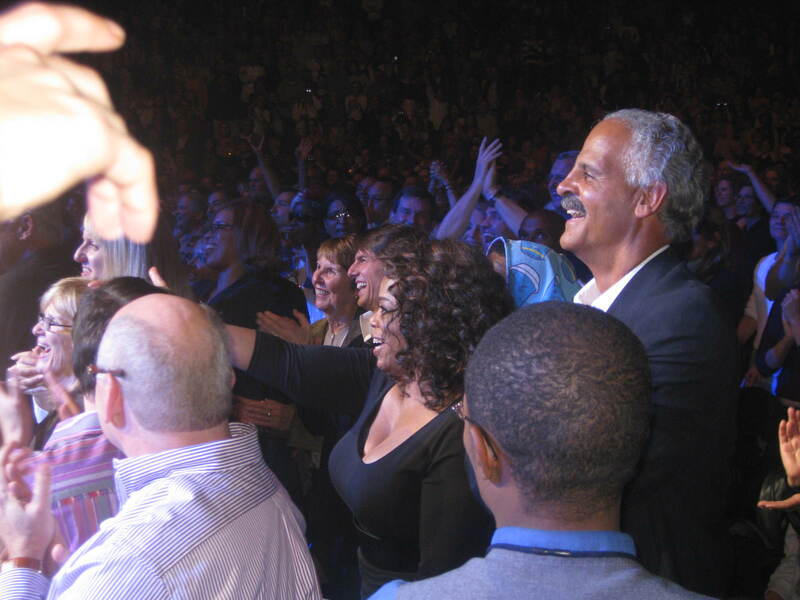 Incidentally, for that concert, I was one row ahead and to the left of Oprah, Stedman, Gayle King, and Tom Cruise. 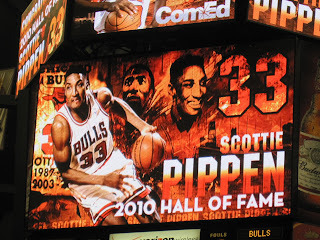 I doubt I'll see Michael Jordan, Oprah, or Tom Cruise at the United Center tonight, but all of you true Bulls fans should giddy up and head to the game! 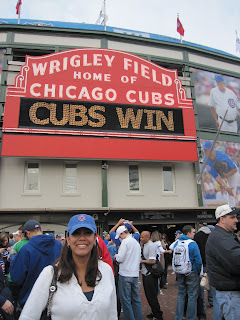 My first trip to Wrigley Field ~ Chicago Cubs win home opener v the Milwaukee Brewers! 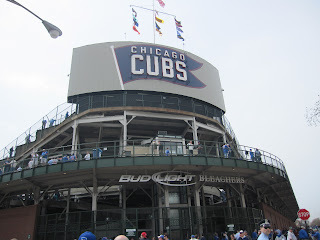 I flew into Chicago yesterday morning with some friends and we all went to the Chicago Cubs Home Opener. 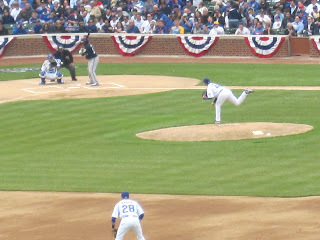 The Cubs were playing the Milwaukee Brewers. On the way to O'Hare, I was sitting between 2 people that were obviously together. Weird. Obviously they prefer window and aisle seats more than they prefer each other, but I digress. As soon as I claimed my bags I hopped a cab to my friend's house to ditch my stuff. Let's call my friend Porkchopper/Pork, because that's his nickname. Pork and his housemates were gracious enough to offer me a guestroom in their house in Wicker Park. After catching up with him for about 15 mins and taking a conference call for work (i.e. even though I am officially on vacation), we decided to take the L into the city. I don't like any form of public transportation. I'll just put that out there right now. However, if I'm with a friend and/or it's efficient, I will do it. Pork is wrapping up law school and had a meeting, so he was only going to take me part of the way on the L. All the other Cubs fans were batting clean up on my way to Wrigley. When they got off the train, I'd simply follow. At the Addison station, I asked a lady where Murphy's was, since that's where the rest of my party would be. 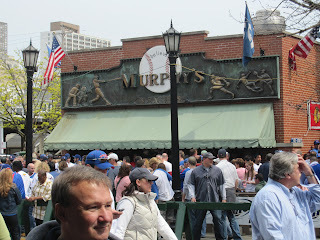 I picked up a Cubs hat at a stand next to the Murphy's for $20 and then went into the bar/restaurant. After joining them and downing a cheeseburger and a beer (i.e. 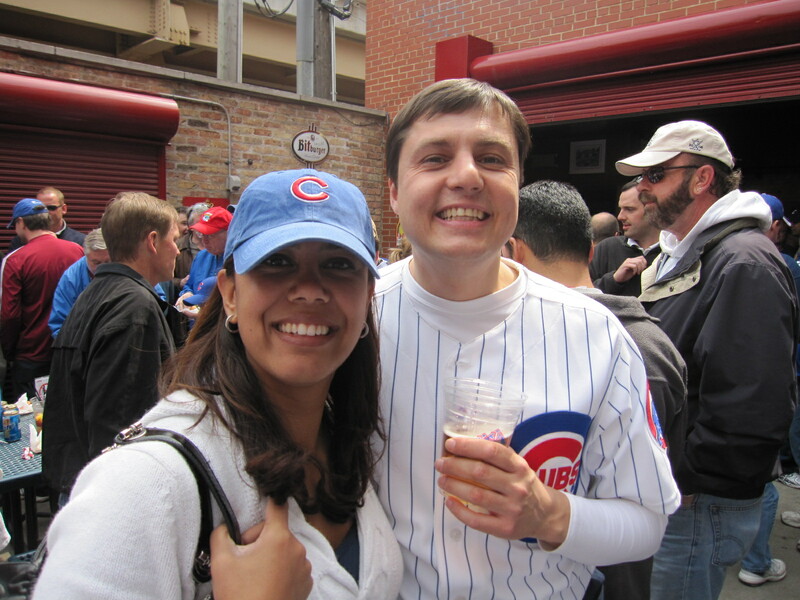 Old Style is the local beer of choice there), we were crossing the street and heading into the Bud Light Bleachers' entrance to Wrigley Field. 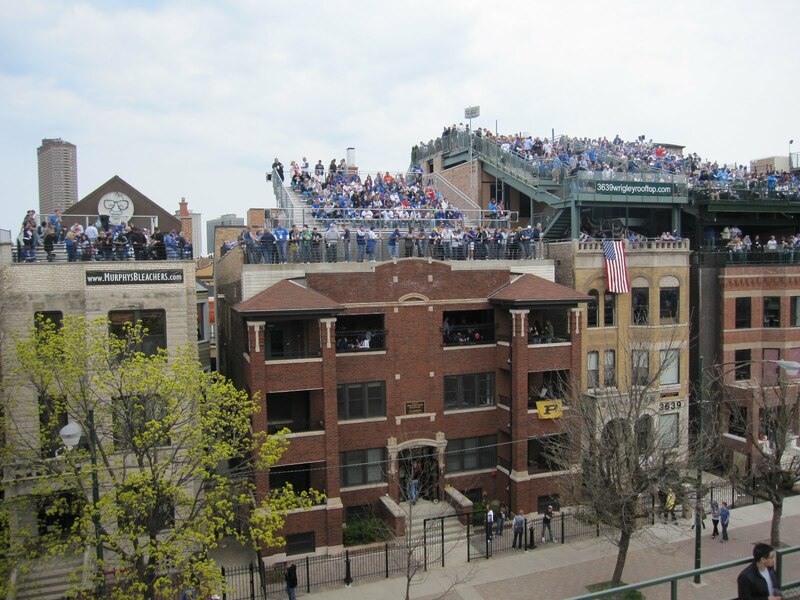 I must admit, I'm not a bleachers fan ~ BUT I've always heard that the way to do Wrigley Field was to sit in the bleachers, so that's what I did. 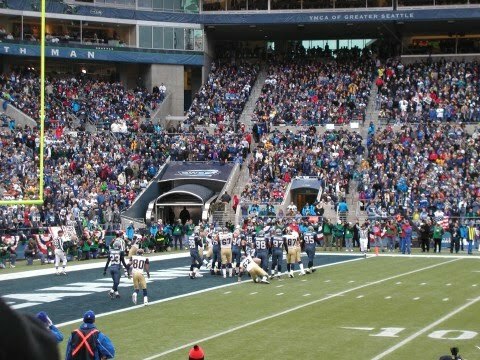 My friend, Bryan, asked me last week if I wanted to go to the game. 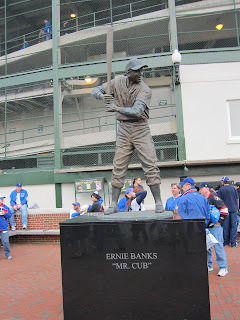 He had an extra bleacher ticket. Initially I told him, "No." I couldn't find flights that were inexpensive enough (i.e. around $600). However, once the idea was planted in my brain, I continued to look at flights. Before you knew it, flights had dropped to less than $200 (i.e. taxes not included) and I was able to make the trip! 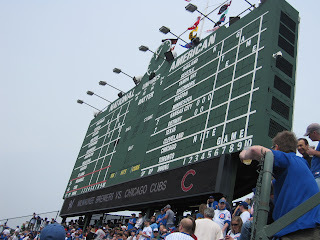 We were able to find a great spot, which we referred to as the "Right Field Sky Box". 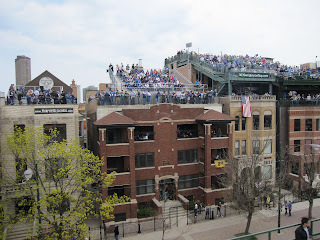 It was a platform with a fence in front of it and all 5 of us could stand and/or sit on the ground comfortably. 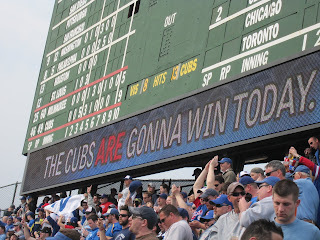 I honestly can't remember, but the Cubs must have hit 3-4 home runs. 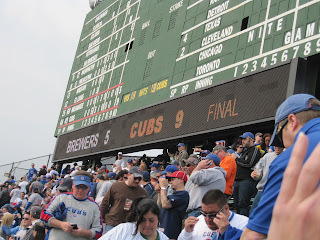 There was a lot of offense in this game, for both teams, and the weather was great. It was a little chillier than Atlanta (i.e. but come on, it's the Midwest and I should've known it wouldn't be that warm in Chicago yet). As I was sipping on mai tai's, I realized that people were correct and that the bleachers were a great time! They're definitely a fun spot to watch the game. ****There was a fight in the bleachers and a bunch of people were tossed out of the game after punching and toppling down a few levels and landing on innocent people. 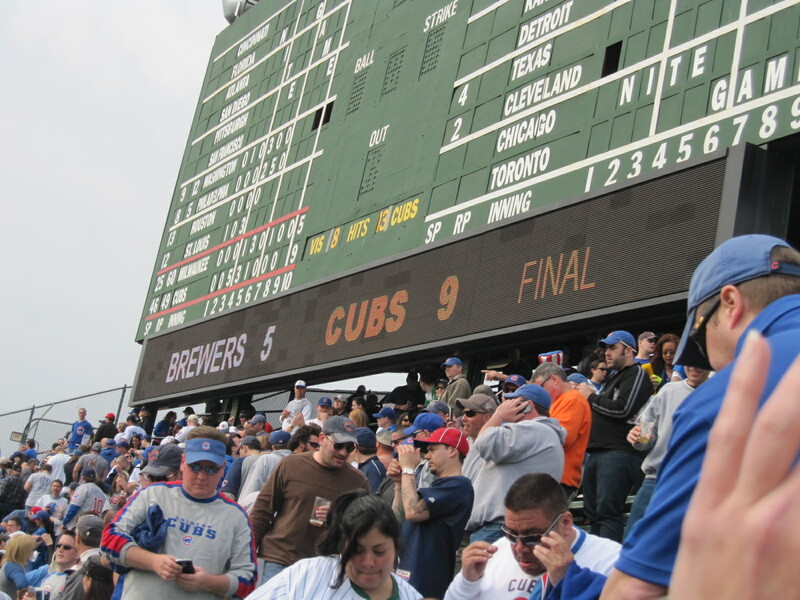 The Cubs defeated the Brewers 9-5. "Hey, Chicago, what do you say?" "The Cubs are gonna win today."